PRIME Minister Thomas Thabane says he will disband a court-martial for 23 Lesotho Defence Force (LDF) officers accused of mutiny, in a move that would end a matter that has dragged on for over two years. Dr Thabane has also said exiled LDF officers would soon return home and be given the option to resume their duties or to retire and get their pension benefits. The premier said this on the side-lines of the 37th Ordinary Summit of Southern African Development Community (SADC) Heads of State and Government in Pretoria, South Africa earlier this week. Lesotho topped the summit's agenda for the umpteenth time owing to bouts of political and security instability that have necessitated the intervention of the regional bloc in one form or another. The Mountain Kingdom has since embarked on multi-sectoral reforms with the objective of attaining lasting peace and stability. 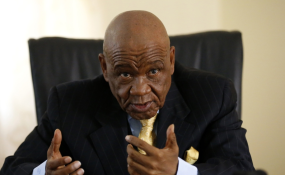 The instability in the security sector had caused Dr Thabane to flee the country on two occasions in 2014 and 2015 saying he had uncovered plots to assassinate him. In 2014, Dr Thabane fled the country on the eve of a 30 August LDF raid of three Maseru police stations which the premier described as a coup attempt. The LDF has vehemently denied the allegation. The raid, which left one police officer dead, triggered a chain of unsavoury events that led to the collapse of Dr Thabane's government and the intervention SADC and other international bodies to bring back political stability in Lesotho. He returned to Lesotho under the protection of South African security personnel in September 2014. In May 2015, Dr Thabane fled again to South Africa and was soon followed by his Basotho National Party and Reformed Congress of Lesotho counterparts Thesele 'Maseribane and Keketso Rantšo respectively who also cited threats to their lives emanating from the LDF, allegations the agency also denied. They were joined by some LDF officers and other Basotho who also cited threats to their safety. Dr Thabane, Chief 'Maseribane and Ms Rantšo as well as other exiles returned to Lesotho on 12 February 2017. But the exiled soldiers stayed put as some of them were still facing mutiny charges. Along with 23 of their colleagues who were arrested between May and June 2015, the LDF officers were accused of plotting to topple the LDF command. The 23 officers were all subsequently released from the Maseru Maximum Security Prison where they had been detained and placed under "open arrest". The LDF has claimed the alleged mutiny plot was masterminded by former army commander, Lt-Gen Maaparankoe Mahao who was shot dead by his colleagues who had come to arrest him for the suspected mutiny in Mokema on 25 June 2015. However, a SADC Commission of Inquiry into the incidents surrounding the former army chief's killing concluded that the LDF's case against the alleged mutineers was "highly suspect" and recommended that they be granted amnesty by the government. The government halted the court martial last month, with Communications Minister telling a local publication they were yet to decide on the next step. However, Dr Thabane told the SABC earlier this week he had decided to cancel the court-martial. "I am going to cancel the ongoing court-martial straight away because it is unfounded and baseless," he said. The premier also indicated that he was liaising with SADC Facilitator to Lesotho and South African Vice-President Cyril Ramaphosa on the return of the exiled soldiers. Earlier this month, senior government and LDF officials held a meeting with soldiers and other Basotho exiled in Ladybrand, South Africa to discuss the modalities of their return. "Some of the army personnel, who crossed the border with me because they were my bodyguards and so on, have not yet made their way home," Dr Thabane said. "And, I am now finalising arrangements with the SADC facilitator, Deputy President Ramaphosa and SADC in general for those soldiers to also come back home." He added: "They will be given the option to go back (to the LDF) and take up their jobs, or to take packages and go home."